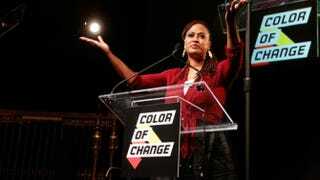 Director Ava DuVernay speaks onstage during ColorOfChange.org’s 10-Year Anniversary Gala at Gotham Hall in New York City Oct. 5, 2015. Notables from the worlds of entertainment, media, politics and social justice came together at New York City’s Gotham Hall to celebrate the 10th anniversary of ColorOfChange.org, the social-justice organization. Co-founders Van Jones and James Rucker greeted Selma director Ava DuVernay; Mara Brock Akil, creator of Being Mary Jane; Planned Parenthood President Cecile Richards; musician Questlove; MSNBC correspondent Joy-Ann Reid; and TV One’s Roland Martin, along with many others.